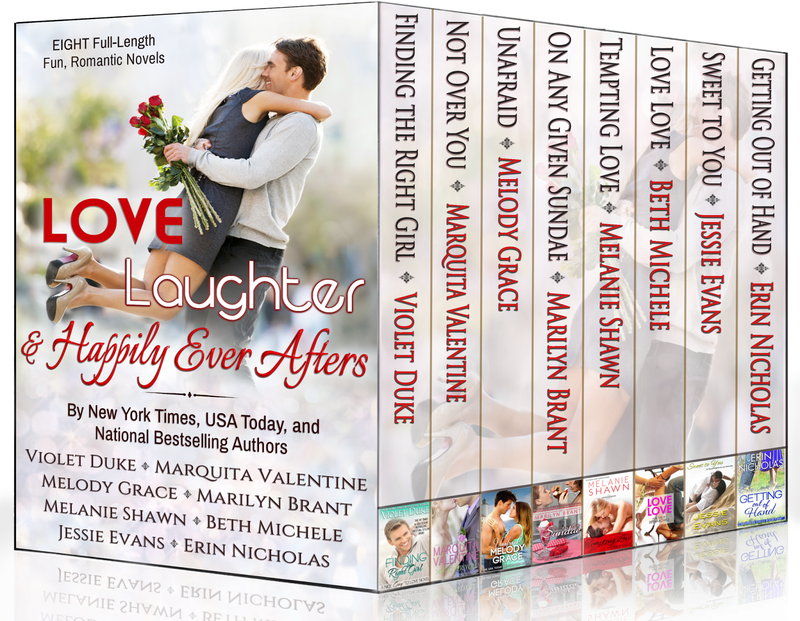 The Love Laughter and Happily Ever After Box Set is here! We're thrilled to celebrate the release of this box set, featuring eight full-length novels! Just in time for summer! An all-star collaboration by some of today’s most popular bestselling romance authors. From the funny and sweet to the steamy and heartfelt, this collection has eight full-length FUN, romantic love stories hand-picked to bring a smile to your face while you’re lounging out in the sun this summer. This limited edition boxed set will only be available until July so get yours today! Total length is 1,800 pages and at just **$0.99** for eight novels, that’s a $27 savings! And in her much-anticipated indie debut, Samhain bestselling author Erin Nicholas with the never-before-published novel, GETTING OUT OF HAND. 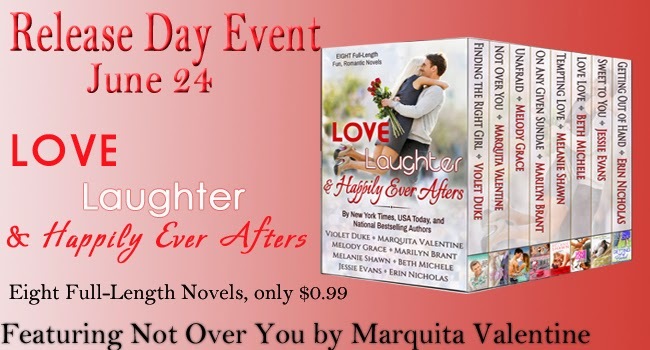 Take a peek at the excerpt and teasers from Marquita Valentine’s contribution, Not Over You. 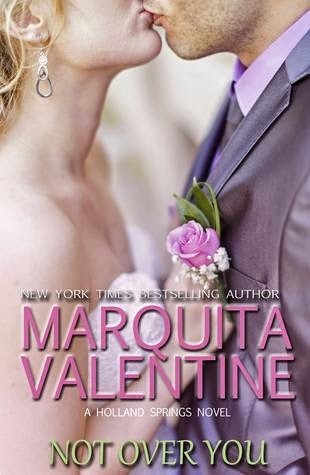 Summer Holland is set on one thing--convincing her childhood sweetheart *and* local preacher's son, Gabriel Edwards, to marry her so she can get back the daughter she gave up for adoption. 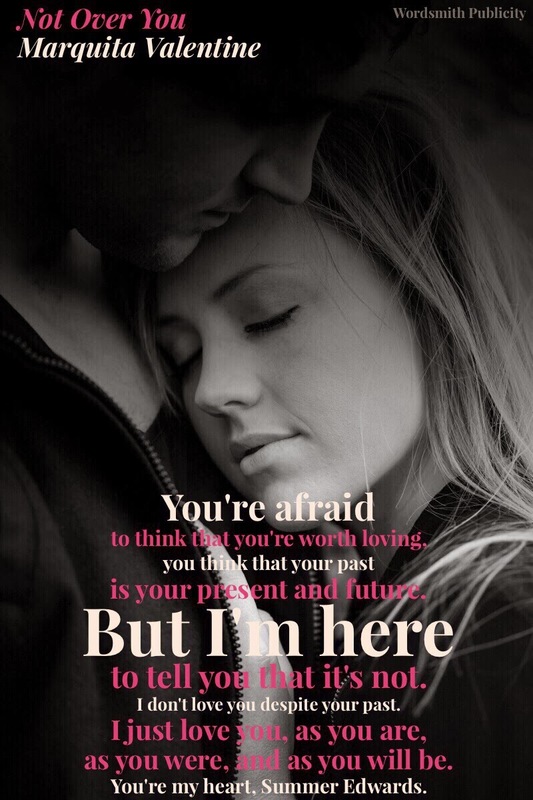 She’s always been able to count on him to rescuing her when she needed it most, but this time is different… there’s a new woman in Gabriel’s life. Only, Summer's not going to let a little thing like that get in her way. 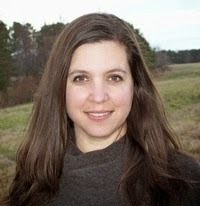 There’s only been one woman for Gabriel Edwards—Summer Holland, the daughter of Holland Spring's most notorious woman. But unless Summer needs cash, food or a place to stay, she wants nothing to do with him. He’s done playing her knight in shining armor. He’s finally found the woman to settle down with—the town’s newest librarian. She’s smart and sweet, and wholly in love with him. Nothing and no one will get in the way of his plans... until, that is, Summer comes home to Holland Springs, and needs his help once more. Determined to protect her heart, Summer tries to keep Gabriel at arm's length, but with one hot kiss, she realizes that not only did she get more than she bargained for, but she might not be over him. The sun slipped under the horizon, making his running lights visible along the blacktop. Great. Just great. How was he supposed to find her? Light glowed from the forest of pine trees by the old Holland place. He slowly braked, put the truck in park, and rolled down the passenger side window, watching as the bugs blinked on and off. Before he knew what was happening, he’d unbuckled his seatbelt, opened the door, and strode into the forest. He crept through the woods, quiet as a predator hunting his prey, and then came to a sight that stole his breath away. Summer, all alone in a meadow of spring flowers. Well, if you didn’t count the fireflies dancing around her. Laughing with pure joy, she waved a hand in the air. The fireflies followed her movements, reminding him of kids playing with sparklers on the Fourth of July. The fireflies continued their dance, moths joining in. Something swept past him. He followed the blur and realized it was a bat, most likely trying to eat the conveniently placed snack. Summer laughed again, drawing his attention back to her. She threw out her arms and spun around. He felt himself drift closer, like he was one of those moths…and she the flame. “Summer.” Her name a prayer on his lips. A plea in his heart.